For this week I'm going to specifically go for developing an air burst generating golem that anyone can use to deploy the parachute with. If some else wants to post a general or specific advisory on working on the projects as a whole, feel free. I know I'm a bit late to this discussion, but why use a golem parachute instead of a regular parachute? it may sound silly but the main reason is this, we use golems in almost every tool we use so it is logical to think our characters would use those means to power such a life saving device. Pulling a rope might just not work, a machine on the other hand is reliable and it won't fail on you so long as you make sure its well kept. Ok, i know its just sounds weird but think of it as a compromise to make sure we added a extra precaution against possible nasty accidents that may occur due to some god like interference i will not name. 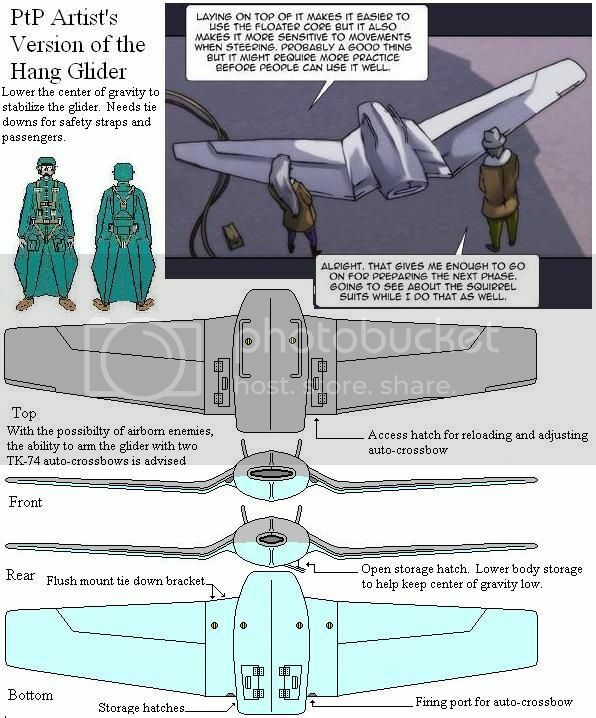 Hfar wrote: I know I'm a bit late to this discussion, but why use a golem parachute instead of a regular parachute? A problem with early parachutes is that sometimes they failed to catch as the user dropped. A chute failure like that happens because the chute doesn't open properly or is opened too close to the ground. Mind you the latter still happens, all chutes need time to catch air before they slow a descent. The air golem not only ensures a good opening, but it lets the user open somewhat closer to the ground, wouldn't recommend waiting to the last moment still though. I guess I just kind of wonder if adding a mana powered machine to a parachute might...complicate things. Add another factor that could become a problem if it fails, y'know? Will only fail if we deal with demons. Demons don't exist on the surface since no one is stupid enough to open a gate and restart the whole mess. Just pray damn hard we never have to come across a demonic infested zone. Might have to write off Damadi as a possible city ruin to explore because of this. It's a sort of bilevel compromise. The biggest engineering trick to a pack parachute is having the canopy deploy correctly once it has left the bag. This involves correct packing, layering, and sequence of layers. All of which we'd have to learn by trial and error. Employing an air driven golem actuator puts us back into the sort of engineering ground we know what we're doing in, inflating and pushing out. 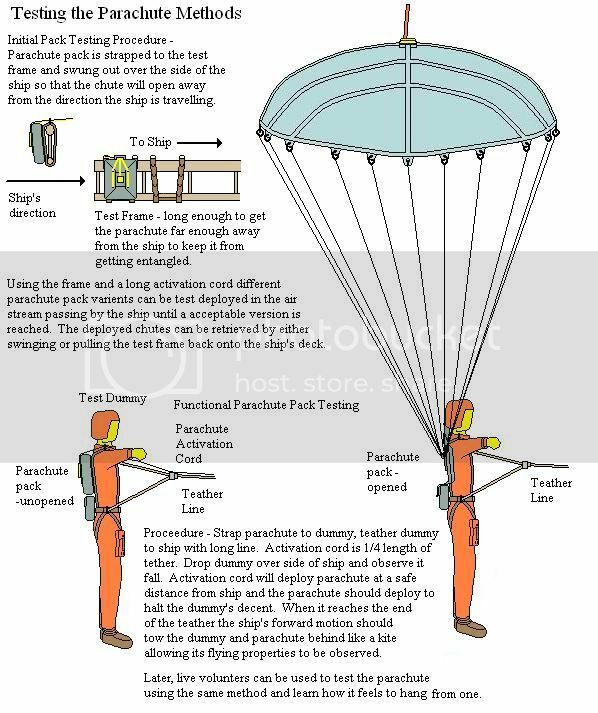 Likewise, creating a parachute would require imagining all the details of how the different steps function and fit together. (This has been emphasized by Suntiger) The catching air to retard falling aspect is easy to connect to sails and cloaks, as is the best shape for them to work the way we want and having them rolled up in a bundle and then spread out when we want to use them. It's how to deploy them that gets a bit tricky to describe how we come up with the idea. Sails are reefed and then dropped using lines to keep their shape, umbrellas and tents use ribs and lanyards. We also have some knowledge of inflatable gas bags and balloons along with sausage casings and pipes. Finally, we've had experience with air sorcery, especially bursts of air that drive things through the air. 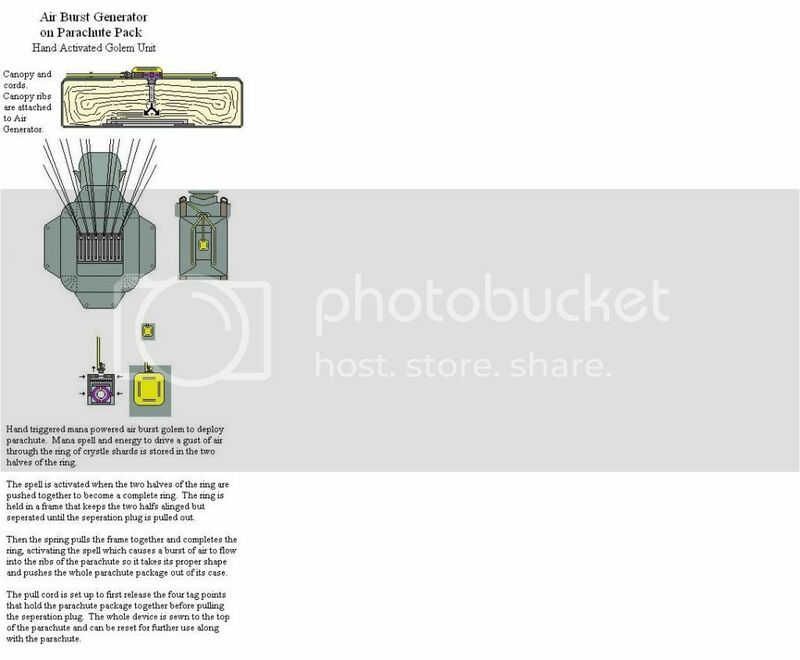 So in the interests of making things easy on our GMs (who like things to be mana powered) I felt a manually actuated (so the ferals can use it) air burst golem device to deploy the parachute from it's bag would make them more comfortable with the idea and save us all a lot of nit-picking over the details of how we invented everything. Last edited by Timotheus on Fri Jan 04, 2013 6:04 am, edited 1 time in total. 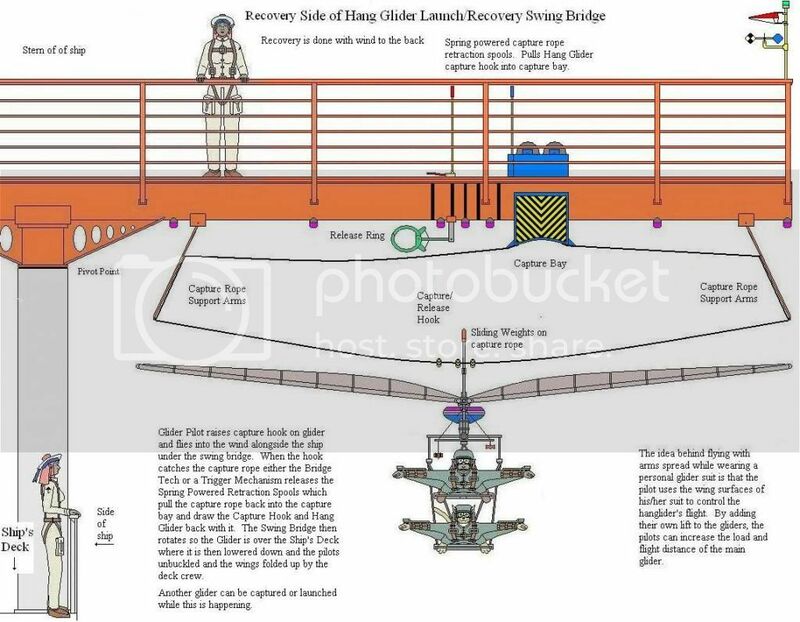 As far as exploring... just sent in the Ferals with REALLY LONG Ropes... Or you could use big baskets on the end of ropes/cables if the ship is capable of hovering. 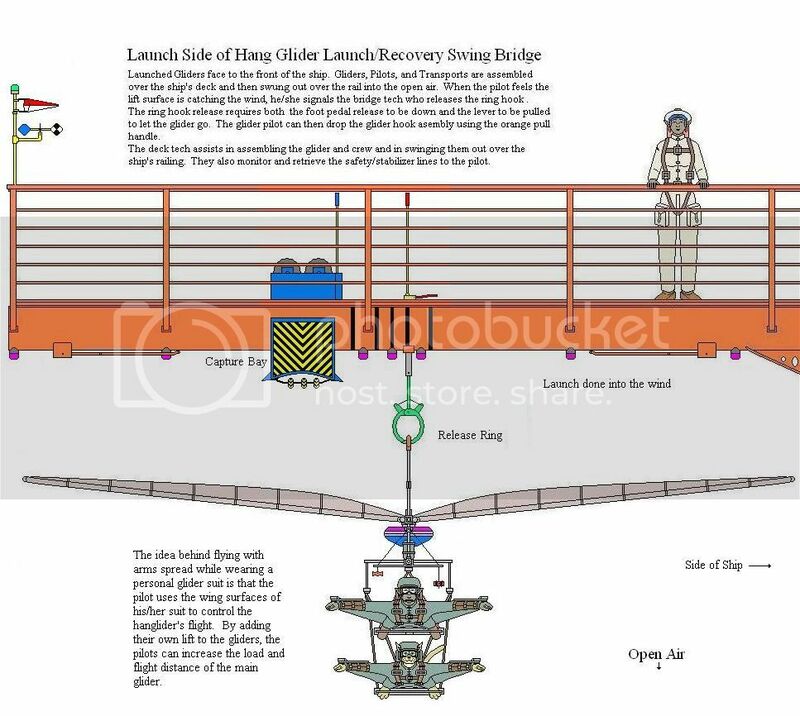 More detaiis of the proposed hang glider including how it could carry two pilots and a proposed launch / retrieval set up for on board the ship. Found a link that is good reading. So Wing suit/Squirrel suit requires Parachute, but may allow for the lack of glider use. Since this seems to be the design that we are going to be working with, may i suggest that we add a couple storage lockers to the bottom of the wing/body surface and a passenger carry bar there. 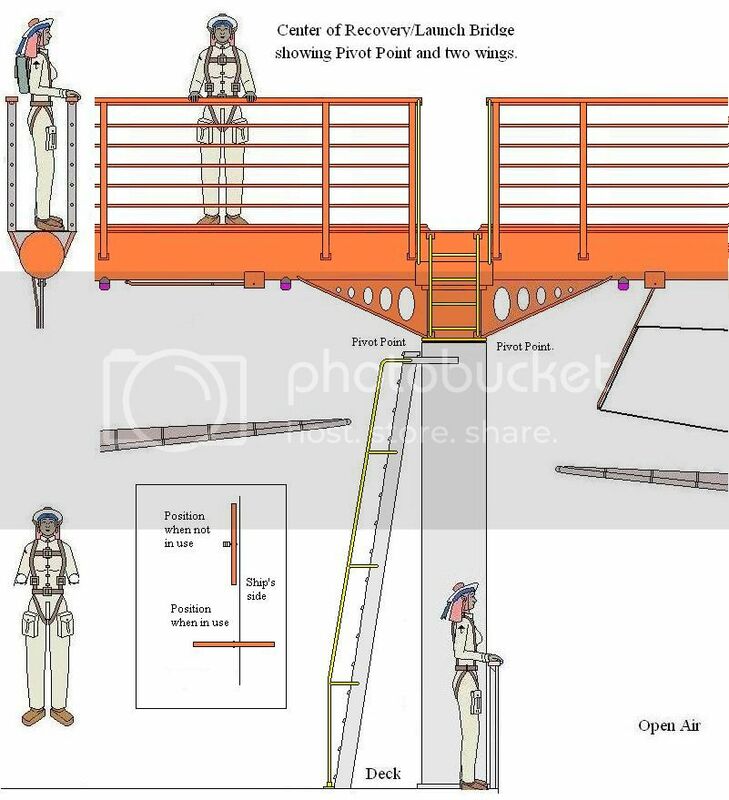 This will lower the center of mass and help make the glider more stable in flight. Last edited by Timotheus on Thu Jul 04, 2013 6:35 pm, edited 1 time in total.